LONDON, UK – Thursday 9 November 2017 - The average UK small business is worth £90,000 in 2017 – down £4,000 on 2016 – according to research by online business transfer agent Bizdaq. 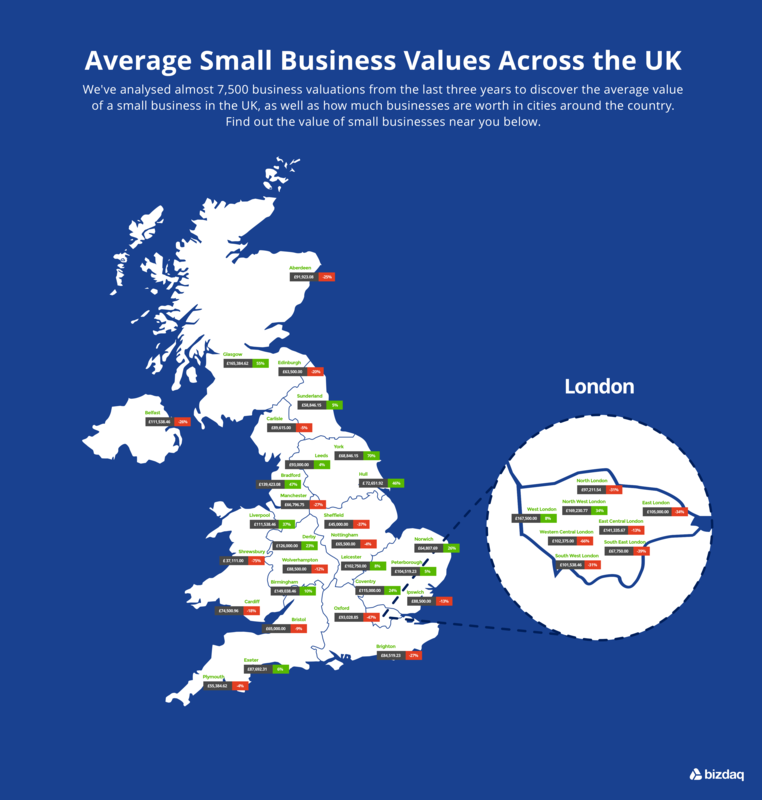 Using data from nearly 7,500 small business valuations performed over the last three years, Bizdaq charted the average value of small businesses across the UK to find out how much return owners could expect on their investment if they sold their business. They found that although small businesses are worth more than they were in 2015 (£89,000), values have dropped compared to last year. As values are directly linked to turnover and net profit, this signals that falling levels of consumer spending, and/or increasing costs, are adversely affecting the values of small businesses across the country – leaving owners unable to reach the true value of their business. Whilst small business values in the North have remained almost the same, dropping from an average value of £80,000 to £79,000, values in the South have fallen from £97,000 to £91,000 between 2016 and 2017. Whilst this fall may be larger than that seen in the North, values are still considerably higher. The research also extended to business types, with Bizdaq finding that the average value of a typical British cafe had dropped in value by 15% to £45,000 in 2017, whilst coffee shops had risen in value – from £62,000 to £65,000. Manufacturing businesses meanwhile have seen a nearly £100,000 increase, climbing to an average of £418,500 from £325,000 last year. This is good news for manufacturing business owners who want to leave the business, as it means they’ll be able to achieve a much higher sale price than if they were to sell the previous year. London is the epicentre of business, and has seen some of the largest drops in price in the UK. The average value of a small business in the capital dropped by £20,000 in the last twelve months – falling from £115,000 in 2016 to just £95,000 in 2017. This drop is five times higher than the £4,000 drop seen around the rest of the country, and means a huge loss of value for the city’s small business owners. This drop can be seen in two of London’s most prominent small business types – coffee shops and restaurants. The value of a London coffee shop has seen a severe drop, falling by almost a third - from an average value of £92,000 to just £62,000 in a year - whilst restaurant values have dropped by a staggering £43,000. Whilst the value of a restaurant in London was £140,000 in 2016, that value has plummeted to £97,000 in 2017 - signalling that either a drop in demand or rising costs is affecting small business owners in the capital significantly. It’s not all bad news though. Café owners in the capital have cause to celebrate, as the value of cafes in the city has risen from £65,000 to £70,000 – meaning an additional £5,000 should they want to sell. Sean Mallon, CEO of Bizdaq, said, “It’s frustrating to see that small businesses are reducing in value across the UK, leaving the nation’s small business owners with diminishing levels of return on their hard work and investment. In a period of economic uncertainty however, this is not unexpected. “It’s interesting to see the differing values from region to region, and surprising how only short geographical boundaries can make a large difference to a business’ value. London in particular has seen a dramatic swing in values over the past year. “A business’ value is in many instances tied to revenues, and particularly profit, so falling values may be indicative of a fall in these across the board, with a recent rise in interest rates putting further strain on the UK’s small businesses. The Bizdaq UK Small Business Value Report used almost 7,500 small business valuations performed on the Bizdaq website between 2015 and 2017. The median was used to calculate the average business value for each of the cities, and the country. This press release was distributed by ResponseSource Press Release Wire on behalf of Bizdaq in the following categories: Personal Finance, Business & Finance, Manufacturing, Engineering & Energy, for more information visit https://pressreleasewire.responsesource.com/about.